The latest advance came when non-contact thermometers were introduced. Not only did they eliminate the need to insert anything into any part of a child’s body (or an adult’s, for that matter), they allowed temperatures to be taken without even touching the child. This was a great step forward for three reasons. First, skittish children no longer had to be convinced to stay still while a digital thermometer was rubbed across their forehead or placed under their armpit or at the entrance of their ear canal. Second, non-contact thermometers allowed parents to take their sick child’s temperature without waking them up – perfect for use with babies and toddlers. Finally, a non-invasive method of taking temperatures greatly lessens the possibility that viruses or bacteria will be transmitted throughout the family. Non-contact thermometers, sometimes referred to as temperature guns, are simply aimed at the middle of the forehead from a specified distance (explaining why they’re often called “guns”) with infrared rays used to determine the child’s temperature. Readings are usually taken within a few seconds, and some models have other bells and whistles such as visual or audio alerts when the temperature indicates a fever, or color-coded LEDs for various temperature ranges. Most important, naturally, is the accuracy of the thermometer which varies greatly between models. We also considered size and shape to be very important, for reasons you’ll read shortly. One more clarification: some manufacturers (and consumers) refer to digital forehead thermometers (the ones you run across the forehead) as “non-contact.” We’ve disregarded those models in compiling our list of the top 5 best non-contact thermometers, which starts…..right now. Until recently, non-contact thermometers were extremely expensive. In fact, the older version of the InstaTemp cost more than $100, and was much larger and less accurate. This most recent update works better and costs less than $40 – we consider that a win-win. The ARC InstaTemp is about the size of your home phone (if you still have one, of course). It couldn’t be easier to use; you simply hold the device about an inch from the forehead, aiming between the eyes and above the eyebrows, and push the button. The temperature reading comes up almost instantly on a backlit LCD display, along with a red, orange or green light. You can probably guess the meanings: green means the temperature is in a “healthy” range, orange means slightly above or below normal, and red means the temperature is well above or below where it should be. If the thermometer is being used incorrectly it displays “LO” instead of a temperature, meaning you need to try again. That’s all there is to it, although you’ll get the most accurate reading if you’re able to wipe any collected perspiration or moisture from the forehead first (not easy to do if you’re trying to take the temperature of a sleeping baby). The ARC Devices unit is silent, so there are sounds to awaken the aforementioned sleeping baby, and it’s the most accurate of all of the non-contact thermometers on this list. The manufacturer says that this model is accurate to within +/- 0.4°F (it can be switched to Celsius mode as well, in which it’s accurate to within +/- 0.2°), and tests show that’s pretty much on the money. ARC Devices also says that the way the thermometer works is with proprietary medical-grade infrared technology; we have no way of knowing how that compares to the ones used in doctors’ offices and hospitals, but the results imply that it’s pretty similar. It doesn’t have the memory function of many other non-invasive thermometers it competes with, but we didn’t see that as a negative – if we have a sick child, we remember their last few temperatures without electronic help. There are a couple of peculiarities of the InstaTemp which should be mentioned. The strangest one is that it works on batteries which can’t be replaced – when the thermometer stops working, it has to be replaced. The company says the batteries will last long enough to take 7500 temperatures, which they’ve figured to be the same as taking four temperatures per day for five years straight. In any event, they promise to replace the unit if the batteries die within two years, and there’s an auto-off battery conservation feature. The other thing we found a bit strange is that there’s no case, just a wall-mounted holder. Otherwise, you just have to put this sensitive thermometer (they warn that you shouldn’t touch the lens and shouldn’t use water to clean it, just a wipe) somewhere safe. It seems to us that a case would be an obvious necessity. Despite those two drawbacks, the InstaTemp is the best non-contact thermometer on the market, at a very nice price. We wish it had been invented and available sooner. The Easy@Home thermometer is noticeably bigger and heavier than the InstaTemp so it’s a bit more awkward to use, which is why we placed it at #2 in our rankings. It performs almost as well, though, and we wouldn’t hesitate to rely on it in our home on a regular basis. We described the InstaTemp as looking and feeling like your home phone; the 3 in 1 is more like a remote control, thicker with a slight “ergonomic” curve to it. It’s made of plastic and sort of resembles a toy, but it definitely is no toy. The larger size does mean a larger and easier-to-read backlit LCD screen for the digital temperature display, though, as well as a display for the handy memory function showing the last 32 temperatures that have been taken with the Easy@Home. Instead of red-orange-green indicator lights, the entire color of the LCD screen changes to indicate the temperature range after a reading is made. You use the thermometer in the same way as the InstaTemp, holding it in the correct position and pushing the button for a nearly-instant readout, with the same +/- 0.4° accuracy range. There’s also a beep that sounds when a temperature is registered, but you can turn that off if desired (when your baby is sleeping, for example). One other feature of this model that we liked was the “recalibrate” function, which takes into consideration an important fact: the temperature taken by any infrared thermometer is just an approximation. The thermometer is really measuring the surface temperature of the forehead and then adjusting the final readout according to the “normal” difference between forehead and body temperatures. 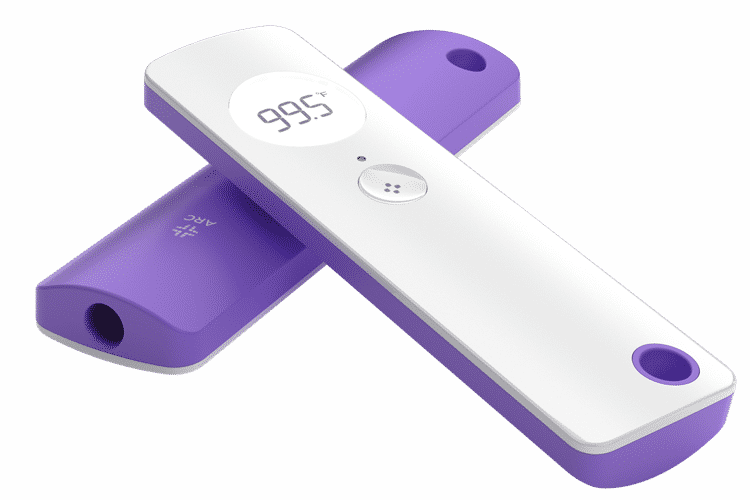 For a small number of people that approximation isn’t correct, so the recalibrate function lets you reset the Easy@Home device to match the temperature measured by an invasive thermometer, to give you an accurate body temperature every time. 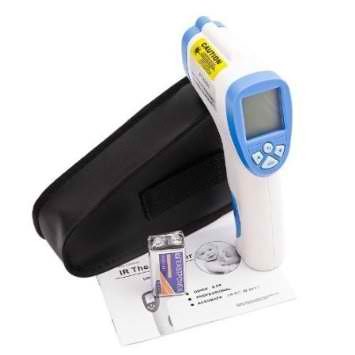 This thermometer comes with a case, works on batteries that can be changed, and costs a bit less than the InstaTemp. If it was smaller to hold (a real consideration when trying to take a baby’s temperature in her crib) we would have ranked it at #1. Oh, and if you’re wondering about the 3 in 1 name, it means you can also use this unit to measure room temperature or the surface temperature of an object, with the flip of a switch. When you figure it out, there are even more bells and whistles which you may find useful or may just seem like overkill. The major one is Bluetooth connectivity, allowing you to hook up to a “Pyle Health” smartphone app to save your temperature readings into a daily calendar or even share real-time information with a doctor. As with the Easy@Home, there’s also a memory function inside the thermometer which will save the last fifty temperature readings. Otherwise, this model operates in the same way as our first two listed thermometers, using infrared rays to accurately read temperatures to within about 0.5°, without needing to touch the child (or adult), and registering the result on a large LCD screen. It does include a case and changeable batteries, and once again we rank it lower than the competition primarily because of its size. Expect to pay around $30 for the Pyle. You can put the words “professional” and “clinical” into a name all you want, but the reality of any product is what counts. The reality of the Luckystone thermometer is that it’s very similar to the Pyle in size and operation, but without the Bluetooth connectivity. The Luckystone works just fine, with a +/- 0.5 accuracy range and a large LCD screen with audio “high temperature” alarm, and can be used to determine room temperature as well as body temperatures. The manufacturer also advertises that the unit has a laser pointer function available; we wouldn’t have thought to use a thermometer in that way, but it’s certainly possible – just not one of the criteria we’d use to choose a medical device. One of the factors we would use, though, is price; the Luckystone scores there with the lowest of any of the thermometers on our list at about $24. As you can tell by our reviews by now, just about all of the non-invasive thermometers we’re recommending are quite similar, and all work well for a reasonable price. The SantaMedical unit is no different, and with a shape similar to our #1 selection we’d be tempted to rank this thermometer higher; after all, shape was one of the reasons for that choice (this unit is larger than the InstaTemp, though). We put the SantaMedical “Professional” “Clinical” down at the bottom of our top 5 best non-contact thermometers, though simply because it comes from China with no warranty. This model is accurate to +/- 0.4 degrees, checks room as well as body temperatures, and is more convenient to use than most of the others in these rankings. There’s also a function similar to the “recalibrate” option on the Easy@Home, but it’s not mentioned in the instructions and is almost impossible to figure out even when you know about it. The SantaMedical costs around $33 and takes a relatively accurate non-invasive temperature without a problem, so it’s not a bad product. It’s just not the best. Why do i need a non contact thermometer? This is certainly a handy tool as you may not be able to keep a sick child still even for a few seconds while you take the temperature from a traditional thermometer or you may end up waking the baby to take a reading. Non contact thermometer as the name suggests does not even come in contact with the baby while taking the reading. How accurate are the readings take on the non contact thermometer? We can say it is nearly perfect. There may be a variance of +/- 0.4 degree Fahrenheit. But that is quite negligible. Is it safe to use the non contact thermometer on infants? yes absolutely. It has been approved by FDA for use on infants; clinics and hospitals also recommend using them. Does the infrared thermometers emit any kind of radiation? The answer is NO. It only reads the infrared energy from the surface it is pointed to. Yes a laser beam is used to point to the exact place from which the device needs to take the reading. Why do i need to point the thermometer to the forehead? Can i point it elsewhere for readings? The temperature taken from the forehead through a non contact thermometer is essentially equivalent to the properly taken auxiliary reading. You could point elsewhere like ear, temple etc, but repeated readings may be necessary to establish the correct one. There is still no guarantee that it coincides with the auxiliary reading. Does the skin colour effect the readings? No the skin colour does not effect the accuracy of the readings taken from it. Does the reading get effected by the outside temperature? Yes it does when it is subjected to too cold or hot temperatures in the room. For example, if the patient is located directly under the AC duct or cooling vent or under a heated lamp. What adjustments do i need to make to my readings when subjected to too cold/hot weather inside the room? Please follow the manual for instructions as every device has its own norms to derive it. How reliable are the non contact thermometers? They are very reliable and last for years. Some come with rechargeable batteries while others are not. You may have to buy a new device if the battery runs out. But will be a good few years anyway. What if the thermometer breaks down much earlier? Most manufacturers replace the device for you free of cost if it breaks down before 2 years. Please read the warranty of the product before buying. Can i use the non contact thermometer for measuring temperature of food, drink etc? Not really. The non contact thermometer is essentially a surface thermometer and do the measure the inner temperature of anything. Hence it needs to be used just for the purpose it is made. Where can i buy the non contact thermometer? You could buy it anywhere in store or through trusted retailers like Amazon. Please read through the reviews of various brands in our review page before buying.